I do a lot of web development with my company. 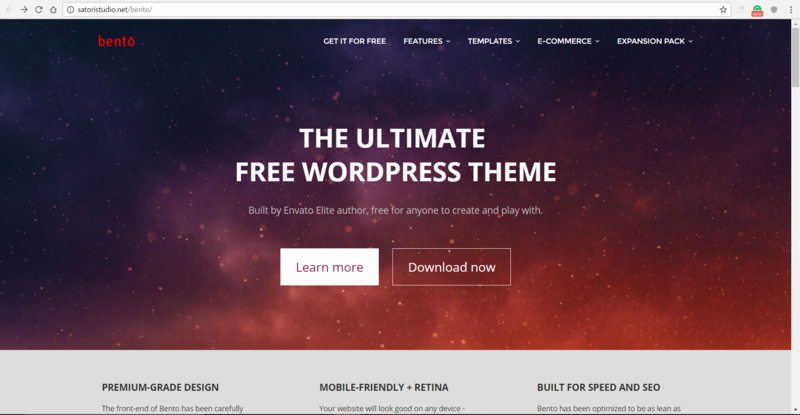 I like WordPress and I like using free themes as a foundation for a site as often as I can. It usually allows us to offer our clients a better rate while cutting down the overall time required to build the site. With the invent of HTML5, CSS3 and mobile-first websites, there is a big advantage to using a base a premade theme because the mobility and structure is already there. We can just add our visual elements right on top. What we like about Bento. Bento uses a modular approach just like the majority of sites these days. They keep it clean and offer the majority of features in their free version. It’s easy to add a child theme and develop your own premium features or you can pay under $30 to upgrade to their pro version. There are a lot of page features available that are customizable on individual pages so you are not locked into a design for all pages. This is great for additional development because a lot of what we will be adding is already available on a page by page basis or easy to tap into. The design is clean overall and very current. Sdatic.com is a quick and easy place for me to record information about code, software and resources that I collect across the net. I wanted a theme that offered a lot of options, a builder and hackability in a free package. Bento is a great option for this and is highly rated across the web. We haven’t needed the premium features such as their portfolio pages and a quick child theme allowed us to add a copyright in the footer so for now, we are happy with the free version. I would definitely consider the paid version if we need the additional features in the future. All around, it’s a great option which you can download for free here. Let us know if you use Bento and if you have any great hacks that you’ve added or if you need any help setting it up in the comments below.